Raise your hand if you love summer! 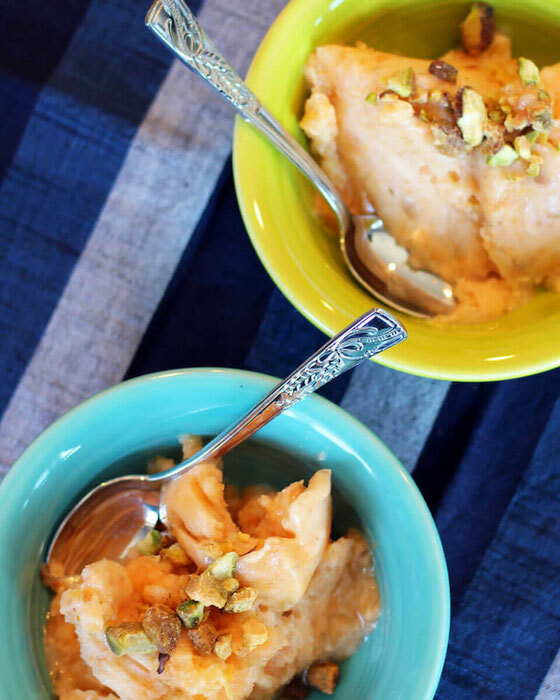 One of my favorite things about warm weather is cooling off with a refreshing treat, like this super simple fruit-based "ice cream" made with cantaloupe, banana, and pistachios. I love dessert, so I'm always looking for healthy ways to add it to my day. One of my favorite ways is a quickie banana ice cream, so I thought about what other flavor combos would work well. 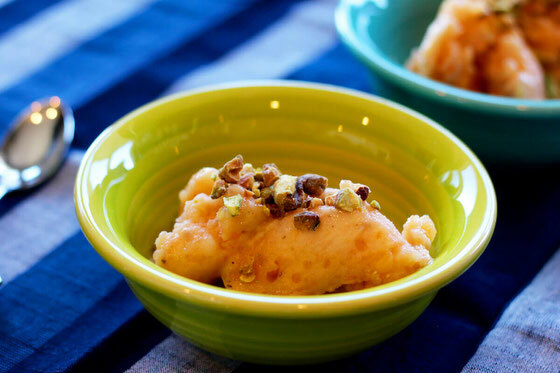 It turns out cantaloupe, banana, and lemon make a delicious frozen dessert treat! To make this creation, I froze banana and cantaloupe overnight in a zip-top bag overnight. Then put the fruit, milk, lemon juice, and lemon zest in a high-speed blender to create "ice cream." Once I had my base, I thought about what food would make the best topping. I chose pistachios because they're full of filling healthy fats, protein, and fiber—so I chopped them up for a crunchy topping. If you want to make this a vegan recipe, just swap out the milk for your favorite plant-based alternative. Now go get your own bowl so you can have treat time, too! Freeze bananas and cantaloupe in a zip-top freezer bag overnight. Place frozen fruit, milk, lemon juice, and lemon zest in a food processor or high-speed blender. Process, pulse, or blend until completely smooth, pausing if necessary to push the ingredients toward the bottom of the processor or blender. (If using a blender, you may need to mix gently with a spoon when done blending.) Place in bowls, and top with pistachios. Enjoy! Makes 4 (1/2-cup) servings. What are your thoughts on this topic? What are your favorite healthy summer desserts?